I was an Assistant Project Manager at Telesis Corporation, a mission-driven affordable housing real estate developer from 2006-2008. 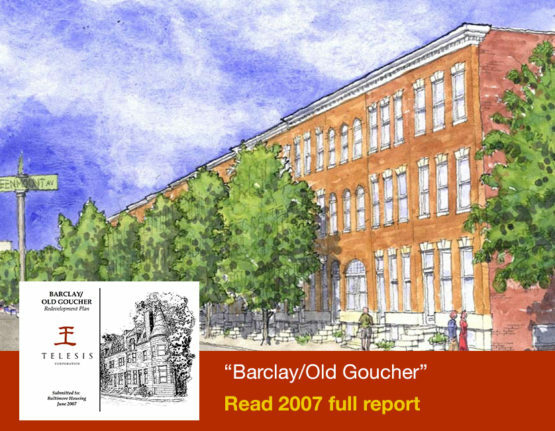 During this time, I co-authored the Barclay/Old Goucher Redevelopment Plan for 268 parcels owned by the Baltimore Housing Authority in a high-crime area with a high concentration of vacancies. Along with demographic and housing data analyses, I participated in over 200 meetings with community members, neighborhood organizations, local developers, neighborhood social service providers, city representatives, local foundations, and elected officials. I also helped organize a community design charrette, which over 50 residents attended. The ideas that emerged from the charrette were used as guiding principles for the redevelopment plan, which aims to transform the neighborhood into a stable, mixed-income neighborhood with quality open spaces, community facilities and employment opportunities.